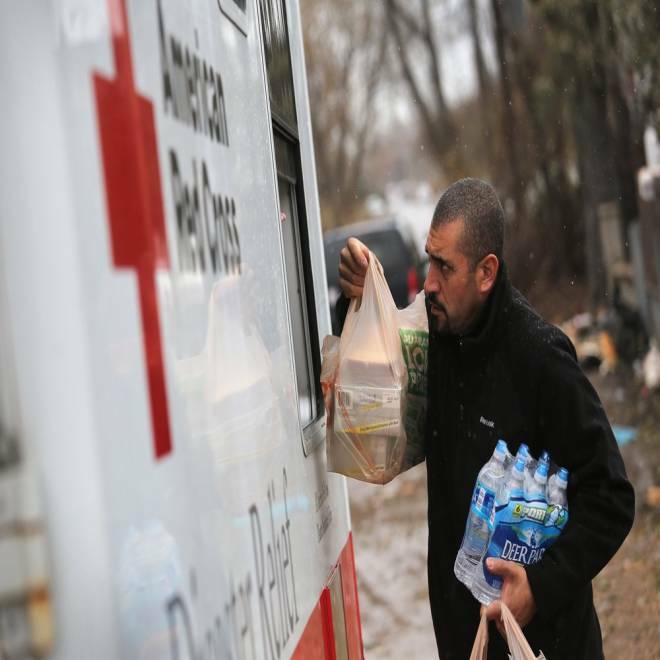 Robert Munoz collects supplies from a mobile Red Cross unit on Nov. 7, in the Staten Island Borough of New York City. The American Red Cross, which bills itself as “the world's largest humanitarian network,” is pushing back against critics of its response to superstorm Sandy, with the head of the organization saying its relief effort has been “near flawless” despite criticism from stranded storm victims and elected officials. Two weeks after the storm slammed the East Coast, leaving millions of residents without power and in need of food, warmth and shelter, the venerable nonprofit has taken a public battering over what many victims and some officials saw as a lackluster and unfocused response. Thomas Donovan, a 43-year-old software salesman who was helping an elderly couple toss out heavy furniture and appliances from their flooded home last week in the hard-hit New York City community of Breezy Point, is among the disillusioned. Red Cross officials have been trying to walk the fine line between diplomacy and defense in explaining why their Sandy relief efforts have not always been appreciated. Two weeks after Superstorm Sandy hit the East Coast, New Yorkers question whether help from the Red Cross will arrive. But CEO President Gail McGovern defends what she calls a massive relief effort. NBC's Lisa Myers reports. Laura Howe, a spokeswoman for the organization, said that responding in a badly damaged, densely populated urban area, and the unique cold-weather hurricane, both posed significant challenges to getting needed supplies to the hardest-hit areas. But she also noted that the Red Cross has mounted its largest domestic disaster response in five years, deploying its entire fleet of more than 320 feeding trucks and sending nearly 6,000 relief workers to the devastated areas, mainly in New Jersey and New York. We are “putting our resources where the need is greatest,” Howe said. “I know that there are people who have absolutely lost everything, that are cold, that are frightened, that are saying, ‘Where is the American Red Cross?’ and I am totally supportive of that. I understand their cry for help, but we are out there,” she said. When asked about the storm victims who are complaining that they haven't seen the Red Cross in their neighborhoods, McGovern said that the organization is using social media to help guide them to areas that they haven't yet reached. "We are looking at every single one of those cries for help, and we are moving people and supplies as quickly as we can," she said. The role of public punching bag is not new for the Red Cross, which has endured similar criticism after disasters like Hurricane Katrina, which hammered the Gulf Coast in 2005. The organization and its response are often held under a microscope, though federal and state government, the military and many other relief groups, also assist in recovery efforts. Howe, the Red Cross spokeswoman, said the anger felt by victims is not surprising, given what they are going through. As of Sunday, the Red Cross was sheltering some 3,700 people and had delivered more than 4.8 million meals or snacks, and more than 477,000 relief items, she said. “We are doing everything that we possibly can to be in as many places as quickly as possible but this is a big operation and we’re up against a large geography and a large number of people that need to be served,” she added. Such arguments don’t seem to carry much weight in communities severely affected by the storm. James Molinari, president of the hard-hit Staten Island borough of New York City, on Nov. 1 labeled the organization’s response there “an absolute disgrace” and went so far as to urge its residents not to donate to the largely volunteer agency. Donovan, the Red Cross critic helping in Breezy Point, said he and his friends have been helping clean up there for about a week and had worked on some 30 homes. The Brooklyn resident, whose family has had a house in Breezy Point since he was a kid, said he had seen only one of the group’s trucks there in that time. “You don’t see them. 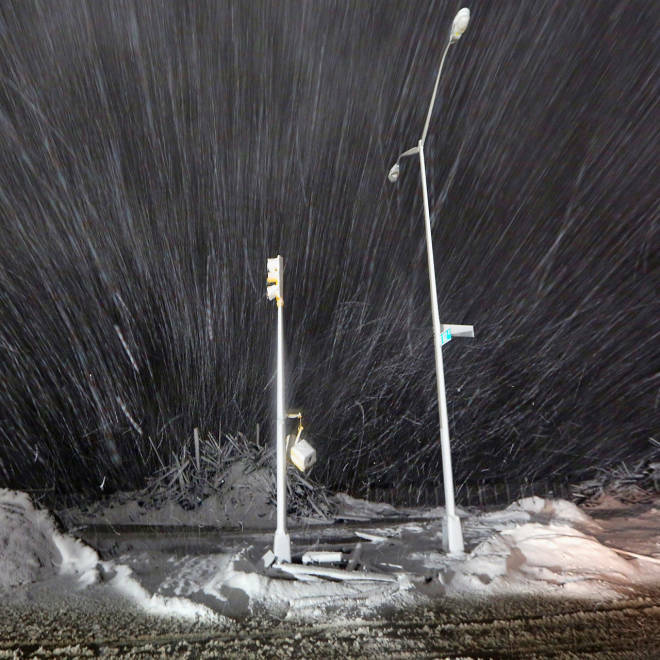 They’re not here ... they’re just not here,” he said Thursday, a day after a nor’easter blew ashore, pushing another storm surge into water-logged areas and dumping about four inches of snow. Other residents are more understanding. 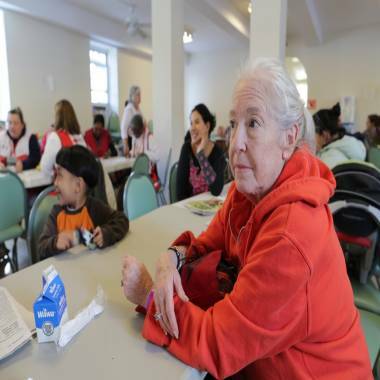 Medeleine Dobriner, 66, of New Dorp, is at her third Red Cross shelter since Hurricane Sandy left her homeless. At a nearby center being used to collect and hand out free food and cleaning supplies, 25-year-old Lauren Willis of nearby Roxbury said that she saw no sign of the Red Cross in the first days after Sandy hit on Oct. 29, flooding both her and her parents’ homes. Since then, however, it has been a regular, helpful presence in her community. Getting the word out about a Red Cross presence in areas where communications are still in disarray after the storm also may feed the perception that the organization is absent. The organization said it was listing on its website the specific streets and communities where workers will be, but of course many storm victims still lack power, let alone Internet access. A reporter saw a Red Cross mental health specialist in Breezy Point in the immediate aftermath of Sandy, and a few days later a Red Cross minitrailer was parked in the community. The organization’s website listed several visits to the community through Sunday. But, like Donovan, many residents interviewed over the last two weeks said they have not seen the Red Cross since the storm. On Thursday, Red Cross volunteers Mary Gagnon and her husband, Dean, drove down Breezy Point’s main road, stopping to offer ham-and-cheese or roast beef sandwiches. The couple, both 65 and retired, are unpaid volunteers who drove a Red Cross minitrailer from Madison, Wis., to help out. “We’re out here. We’re all around. We’re everywhere,” said Mary Gagnon, noting that she and her husband rotate between communities at the direction of a central dispatch. The Red Cross has raised some $117 million in the aftermath of the disaster, though officials say they can’t yet say how much has been spent on the relief effort. Calculating spending is complicated, because bills are still coming in and some services are covered by ongoing contracts, but Howe promised there would be a full accounting at the end of the response effort. Charity Navigator, a nonprofit charity rating agency that aims to be a guide to intelligent giving, said the Red Cross received three out of four stars this year -- meaning it met most industry standards -- down from four the year before. Their ratings cover financial accountability and overall transparency. Its president and CEO, Ken Berger, said his analysts have seen a slight decline in the Red Cross’ finances, such as fundraising efficiency. He also noted its working capital, equivalent to a “rainy day” fund, is not as large as they would like it to be. “For an organization of this size and scale that’s somewhat unique in its expertise and reach, that they may not always be as fast as we’d like, they may not always be as responsive as we’d like, but … we think they’re overall performance at this point is OK,” Berger said. “There’s still this lingering sense since Katrina that Red Cross still has some work to do to redeem its reputation,” he added, noting the Sandy response may prove to be a “key indicator” of whether it has improved sufficiently. To that end, it is making an intensive push into some of the most hard-hit areas in New York and elsewhere through Monday. Volunteers will climb the stairs of apartment blocks to hand out relief items, like a heated “shower in a bag,” hand warmers, garbage bags and work gloves, she said. But, Fran Menchini, 79, who plans to engage a private contractor to clean her flooded home in Breezy Point, said she doesn’t think the Red Cross had anything to offer her. NBC News' Senior Investigative Correspondent Lisa Myers and Producer Talesha Reynolds contributed to this report.